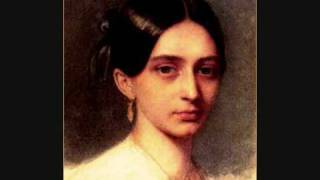 Clara Schumann née Clara Wieck (1819 – 1896) was a German composer-pianist and wife to Robert Schumann. They formed a beautiful musical business partnership until his untimely death. From an early age Clara's prodigious talent at the piano was esteemed throughout Europe. Her talent at the keyboard attracted fellow composer Robert Schumann, and the pair married in 1840. Clara also shared many years of close friendship with Brahms, who said she inspired all his best melodies. Clara continued to perform throughout her life, championing many works by her husband and Brahms, but her skills as a composer were never fully realised. Balancing her husband's mental instability, the pressures of a solo career, and a family of eight children put pressure on her time, but she still managed to create many important works: her Piano Concerto, Piano Trio and songs set her apart as one of the most talented - if not one of the most overlooked - composers of the era. Clara was unsure if she should continue to write music because she was a woman. She said: "A woman must not desire to compose — there has never yet been one able to do it. Should I expect to be the one?"